Ultrasound Technician Schools - How to become an Ultrasound Technician? Ultrasound technicians or Sonographers, as we think and see in movies are not restricted to scan the tummy of a pregnant woman to see the movement of the baby. They are responsible for much more than that. Ultrasound technologists do more important things like scanning and diagnosing several medical conditions ranging from pre-born baby to an Adult and elderly people. 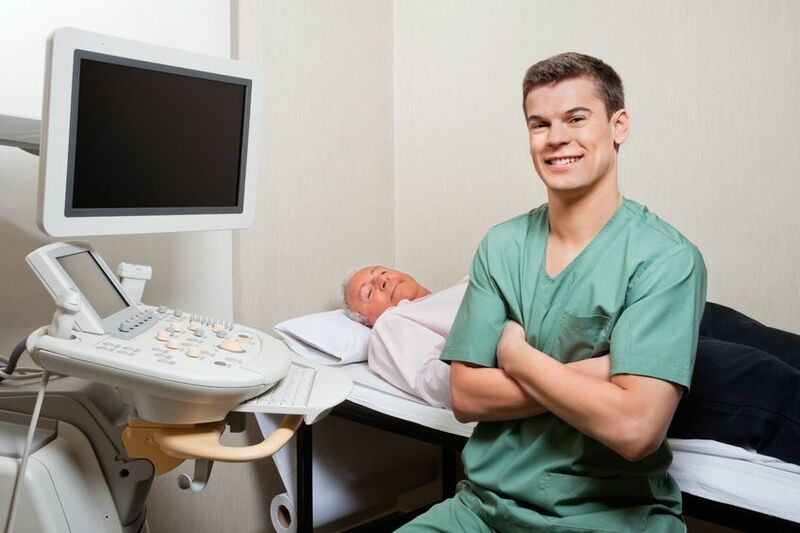 Here in this article, we will discuss how to become an Ultrasound Technician, we will brief about the Time involved, the certificates and about your possible first salary, etc. So, let’s start with the procedure below. As mentioned earlier, this Ultrasound technology field is not just limited to scanning wombs for women, it has many other specializations that include Cardiac, OB/GYN, Ophthalmic, Vascular, Abdominal, Breast, Intervention, and many more specialties. It takes advanced skills to become one of the best Ultrasound Technicians, one should have a strong grip over the subject and the apparatus or devices used to complete the job. They must take utmost care to focus on Anatomy. Because that is how they come to know where to scan to diagnose the issues in the patient. Sonographers should have a great skill to use the Ultrasound devices. As Ultrasound waves released from the scanner hits the body parts to diagnose the inner parts of the body. If the Ultrasound technician has nil knowledge about the device used or Physiology of a human being, he may end up creating issues to the Hospital organization. The imagery recorded by the right placement of a patient is the preliminary report of the diagnosis on which the doctors identify the issue and operate on patients. It is not about the time that matters, it is about the skillset that matters when it comes to becoming an Ultrasound Technician. As said above, the Ultrasound technician generally uses the Ultrasound device, to send sound waves of no radiations into human bodies to identify soft tissues, internal organs, and fetuses inside the womb. So, once you master the Physiology and anatomy of a human being, then are you already half-eligible to become a Sonographer. And when it comes to examination periods, that phase is very important. As the entire process is enjoyable and Ultrasound technicians, use this period to scan the body, by placing them in right gesture and helping doctors with their diagnosis to understand the issue or disease quickly with the Ultrasound device imagery. Click on the states name below to view the list of ultrasound technician schools information. There are few specifications that you need to fill up to be Ultrasound technician. They are mainly based on Education qualifications and training. • Education: Students who are interested in joining as Ultrasound technician should have Bachelor’s degree or Post Graduation degree from an authorized college with an accredited program. And the ones who don’t go to the colleges that are authorized or don’t join the course that has accredited program will not be considered and rejected immediately. And if you wish to join the course after your high school, just be aware that you have good technical skills, mainly in the Sciences, Mathematics, and great knowledge of computers. Everything you do after you become an Ultrasound Technician is related to computer-based AI technology. And if you think of joining courses online then make sure the courses end up giving accredited certificates that you’ve completed the course successfully. • Training: And then when it comes to practical skills, people who wish to become a Sonographer should have many technical skills on how to manage an Ultrasonic device, and, they should have about 1000 hours of Clinical/Practical training to qualify your exams. After all these programs and exams are bypassed, the candidate should then be registered and should earn the credential RDMS (Registered Diagnostic Medical Sonographer). And the graduate students should pass the exams conducted by either ARDMS or by ARRT. Also, remember the exams you write differ based on your specialization. Ultrasound Technician Salary. How Much does Ultrasound Technician Make? It is believed that people who have all the certificates mentioned above are likely to earn more income. And people who have more experience and served as a head of the department or people who serve for Private organizations or hospitals can earn more if you become an Ultrasound Technician. The estimated salary for an Ultrasound Technologist according to U.S. Bureau of Labor Statics, is $67,530/annum. The range being $46,930-$93,850. And it is measured that the growth in this Ultrasound field increases for about whooping 46% from 2012-2022. The main job of a Sonographer is to scan a person, placing them in a right gesture and diagnosing them with the right movement of the device. But this job may be of two types. One being stationary with the patients coming to them for the scans. And the other being bedside ultrasound scans, where the Sonographer should go to the patient who can’t come down for the scans and scan them for diagnosis. And day or night doesn’t matter in this job. All that matters, is being professional and helping the physicians with the preliminary results through the Ultrasound imagery is the primary job of the sonographer. The Sonographer is often on his feet and should be careful as he will sometimes be exposed to various diseases including the deadly ones like HIV. So, overall to become an Ultrasound Technician, you will need 18-24 months of training and education on Sonography as Bachelor’s degree and Master’s degree with an accredited program. And 1000 hours of Clinical training is all that requires becoming an Ultrasound Technician. They need excellent verbal and critical thinking skills to capture the right image of the human body (Anatomy) to diagnose the issue. Career opportunities range from starting as an Ultrasound Technician to Management roles like Senior Technologist or Program Director. If you follow above said educational qualifications, training, and have a keen interest in this field, then that would be enough to become a successful Ultrasound technician.